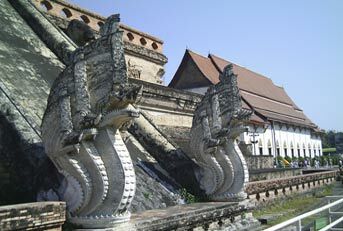 Trip Description: Visit and explore 4 revered temples in Chiangmai. All constructed during the Lanna period, each reflects the glory, splendors and nobility of a rich historical era. In the West of the city lies Wat Suan Dok. Built by King Kuna, the large white chedi towers above the numerous small ones and contains the ashes of the Lanna King and the remains of many generations of the old Chiang Mai Royal family. 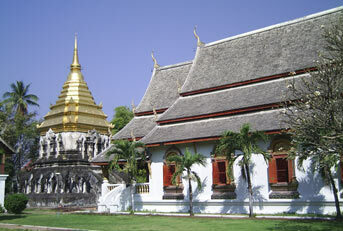 A short distance from Suan Dok Gate (Western Gate) is Wat Phra Singh. First built during the reign of Phra Chao Kham Fu (1328-1335) the temple compound includes the Lai Kam Chapel and the abbot of this important temple is the head of the local religious administration. Lying smack in the heart of the city (almost right in the middle of the square-walled city) is Wat Chedi Luang. 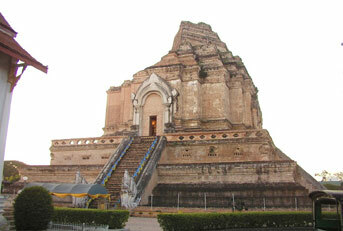 The large chedi (the biggest in the city) behind the viharn was constructed by King Saen Muang Ma around 1401. Originally 90 meters high, it is now a mere 40 meters as the result of an earthquake in 1545. A small building near the main entrance encloses the "Sao Intakin" (spirit of the city). 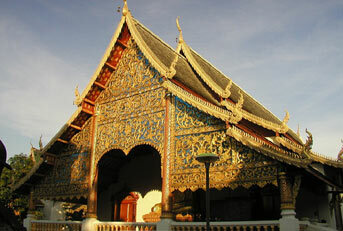 Last but not least is Wat Chiang Mun. Lying in the Northern part of the old walled city, it is the oldest temple within the city walls. Constructed by King Mengrai (1296-1311) the founder of Chiang Mai, it is said that the king spent his last years at this temple. After all this heavy stuff, how about something light.